We have a gorgeous new kit for you this month! The Snowflake Splendor Card Kit will be available Tuesday, October 17 9pm EST. I have a couple of cards to share with you today, the first one is very simple. To create the snowflakes I used the Layered Snowflakes Die-namics with Pink Lemonade and Bubblegum card stock. I added a touch of glitter to the snowflakes to give them that extra little sparkle. For my second card, I went for a completely different look. 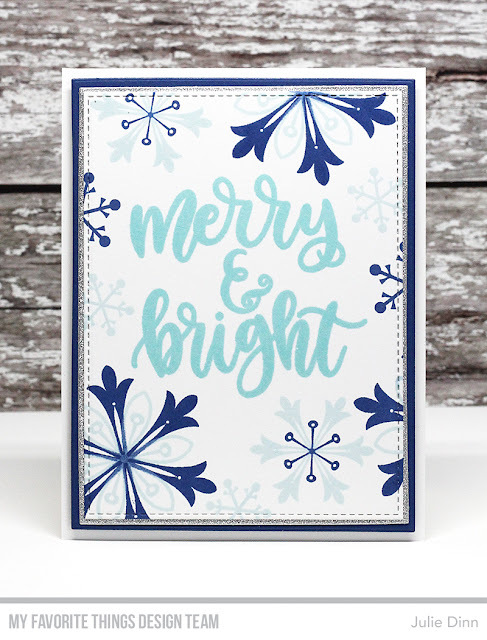 I used the Snowflake Splendor stamp set to stamp the snowflakes in Sno Cone and Blueberry Premium Dye Ink. The sentiment is from Handwritten Holiday, it was stamped in Summer Splash Premium Dye Ink. I added a touch of sparkle to this card with the layer of Silver Sparkle card stock. Two great cards--my fave is the blue. I’m in love with the bubblegum and pink lemonade, absolutely beautiful card! Snowflake cards are always so beautiful love the pink color. Great job. Beautiful card, I love the pink one. I never thought to use pink with snowflakes,but they are beautiful. I really like both cards. Beautiful cards!! I love the soft pink one a lot!! Very pretty cards - thanks for the inspiration! Gorgeous cards...love the Bubblegum color for winter! So pretty - pink snowflakes. I love the blue holiday card too! Such beautiful cards, love these new layered stamps and dies! These are two beautiful cards ! Both cards are simply amazing!